Christina Lake Community Map. Also, be sure to visit the Christina Lake Public Beach. Christina Lake Trail Map This is the Christina Lake Recreation Guide & Trail Map! It gives a good description of the surrounding trails, rates them as easy, medium or hard, and gives an approximate distance and elevation change for hiking and biking. There is also an online interactive version of the Trail Maps, click Christina Lake Trails Map or go straight to the trail descriptions: Christina Lake Trail Summaries. TrailForks - Mountain Bike Trails TrailForks is a comprehensive website for mountain bike trails that will give you information on everything from ratings, whether the trail is easy or hard, conditions and much more! 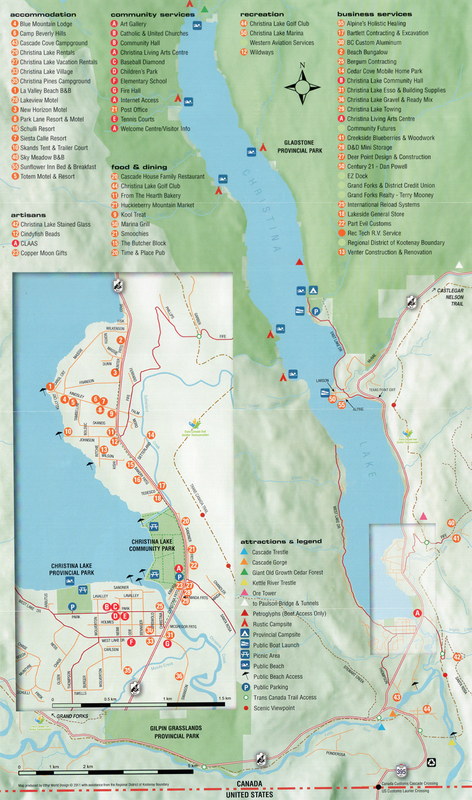 Cycling BC's Trans Canada Trail This website has detailed information, suggested trips, photos and maps for hiker's and biker's who wish to explore more of BC's Trans Canada Trail and its stunning landscapes. For further info, books, etc see the Trans Canada Trail Foundation Website. Boundary Trails Guide & Maps Published in 2003. This guide contains more trail and recreational information in our area nearby. Gladstone Provincial Park Gladstone Provincial Park surrounds the entire northern half of Christina Lake and has many beautiful beaches. Boat access recreation sites are available on the western shore of the lake, at popular Axel Johnson, Parson Creek, Ole Johnson, Starchuck Beach and Treadmill Creek. Season Water Sports Christina Lake's only watersports school and watersports charter service. They offer wakeboard, wake surf and waterski lessons/charters for all ages. Lessons and Charters include boat, coach/driver, gas, life jackets and watersports equipment. They also have Stand Up Paddle Boards (SUP) and Bike rentals too. Make your Vacation at the Lake a memorable experience with Seasons Watersports and Rentals. Delivery, Pickup, & Weekly Rentals available, book today 250-442-7020. Christina Lake Golf & Country Club The Christina Lake Golf and Country Club, is an 18 hole championship course, rated one of the top 25 in British Columbia. Cascade Par 3 Golf Course Just down the road is the 9 hole Cascade Par 3 Golf Course. This well-maintained public course is a beautiful and quiet setting. A wonderful outing for the whole family. Owl Mountain Ranch Take a horse riding adventure with Owl Mountain Ranch located just a few minutes from the lake. They offer several scenic tours with spectacular views and a refreshing river ride tour! Horses and ponies for all ages are available at reasonable rates. Wildlife Safety Guide Please take the time to review important wildlife safety material prepared by the Ministry of Environment. Safety Guide to Bears in the Wild. Safety Guide to Cougars in the Wild. Phoenix Mountain Ski Hill Phoenix Mountain Ski Hill is a great little ski mountain that is only about a 35 minute drive west from Christina Lake. This ski hill is great for a day of family fun with the kids or for the novice skiier or boarder. Phoenix also has night skiing! Red Mountain Ski Resort Just 45 minutes away in Rossland, Red Mountain has fabulous downhill terrain and a history dating back over 100 years! Red Mountain is a top-ranked BC interior ski resort with 360-Degree decents and 7 chair lifts with 110 marked runs. Skiing Magazine listed Red Mountain in its top ten powder skiing resorts of North America. Boundary Snowmobile Club Based in Grand Forks, The Boundary Snowmobile Club promotes safe and responsible recreational snowmobiling and invite you to come and ride with them. News, Photos, Forums & Avalanche information is available or check out BC Snowmobile Federation, or contact the Christina Lake Snowmobile Society at 250.447.9270. Maintained trails at the Paulson Summit nearby offer a variety of snowmobiling options. Grand Forks Aquatic Centre & Arena The Grand Forks Aquatic Centre & Arena are located just 15 minutes away. Check their website for public swimming and skating times or contact the Recreation Office / Arena at 250.442.2202 or Aquatic Centre at 250.442.3488. Gem Theatre The Gem Theatre is just 15 minutes away in Grand Forks. They offer Digital and REAL D 3D movies with Digital Surround Sound! Ainsworth Hot Springs Ainsworth Hot Springs which originated in the Cody Caves area is considered to be one of the best commercial hot springs in British Columbia. Nelson, BC Nelson is a great day trip and recreational area to explore. Situated on Kootenay Lake with excellent views, the downtown area is packed with good restaurants, cafes, coffee houses, local shops, outdoor stores, & small art galleries! Kootenay River Dams Take a drive to Nelson on Hwy 3A and explore the 4 hydro-electric dams along the Kootenay River. The Corra Linn, Upper Bonnington, Lower Bonnington, and South Slocan Power Plants are all managed by FortisBC and have a capacity of 235 MW! Greenwood, BC Just 35 minutes away, Greenwood is not only the smallest city in Canada, but also a great Canadian tourist attraction! Beautiful old architecture, local shops, saloon, bakery, & museum are all their to explore. Greenwood has walking and driving tours, the Tunnel of Flags, the impressive Boundary Falls, and lots of mining history. The "city" is famous for the 1999 movie ‘Snow Falling on the Cedars’ starring Ethan Hawke. Grand Forks, BC Grand Forks pretty much has everything you need. Lots of shopping, The Aquatic Centre, Ice Arena, & Movie Theatre are all here and easy to find. Grand Forks has some nice tree-lined streets and heritage homes. Rock Candy Mountain Mine Big Rock Candy Mountain is close by and offers family-friendly nature tours and safari's to this BC Heritage mine. Collect sparkling quartz crystal geodes, fine fluorite in green & purple, and beautiful barite, while enjoying spectacular mountain scenery & abundant wildflowers. See their website for more information or book at 250.442.5835! Stonerose Fossil Centre Located about an hour away in Republic, WA you can spend a few hours searching for Fossils! Visitors to the Stonerose Interpretive Center can see the 50 million-year-old fossil that was featured in the July 2002 issue of National Geographic. Cody Caves Provincial Park Cody Caves is a unique provincial park located in the Selkirk Mountains above Ainsworth Hot Springs. In the Cody Caves System, an underground stream flows over one kilometre through ancient limestone. Guided Tours are intermittent, so be sure to check before taking the 2 hour drive. Boundary Museum Located in Grand Forks on the Fructova Heritage Site the Boundary Museum has some great exhibits including Wildlife and Environment, CPR, Mining, and the City of Phoenix. On the grounds they have a spectacular view of the south-west valley, and a bread oven and fruit drying facility. Kettle River Museum Located at "Mile 0" of the Kettle Valley Railway, one of the Museum's main attractions is the original Station House from 1900. Exhibits commemorating the steam railway era of Southern British Columbia along with a restored CP Rail caboose. Kettle River Festival of Arts An all-encompassing, region-wide celebration of arts, music, theatre, culture, heritage, and food in Boundary Country. Visit their website for a calendar of events in the area. Christina Lake Golf & Country Club Enjoy the fabulous patio overlooking the course or just pop in for a drink. Lunch and dinner menus are also available. Lisa's Bistro Located in the Welcome Centre, a meal here is a must, especially breakfast or lunch! Smoochies Brewing Co. Organic coffee, drinks, & homemade breakfast and lunch on the patio. Ice Creamery Another must do on a summer evening in Christina Lake! Open June, July, August, 50+ Flavours are offered. Located North on Hwy 3 just past the bridge over Christina Creek on your way to the Welcome Centre.